Thrown if an application tries to call a specified method of a class (either static or instance), and that class no longer has a definition of that method. Normally, this error is caught by the compiler; this error can only occur at run time if the definition of a class has incompatibly changed. What’s the hack going on here! Libraries used are embedded into the final archive I did verified that! If you don’t know simply suspect classloaders, publicly known enemies of java developers 🙂 As rule no.1 which says: “Verify your assumptions”. 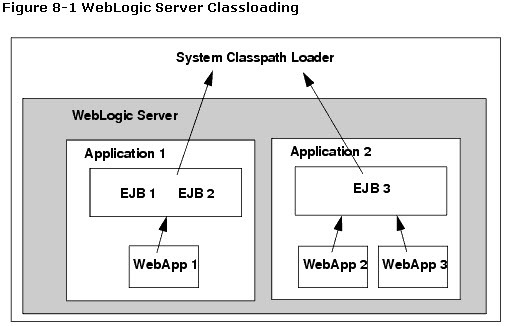 The fact that the class is in archive doesn’t necessary mean that it gets loaded, so to verify that simply pass -verbose or -verbose:class argument to weblogic’s JVM in startUp.sh/bin and you will get the origin of loaded classes. Class loaded from WL_HOME/modules, how’s that possible? To understand that general understanding of classloading is essential and then understand your J2EE standard implementation e.g. Weblogic, JBoss, … This post is not going to pretend an expert detail knowledge level on this topic so I will rather stay with general principles with reference to details documentation. as you can see system classloader is the parent of all the application’s classloaders, details can be found here. So how the class get loaded from WL_HOME/modules ? The framework library must be on system classpath. On the system classpath is just weblogic.jar not my framework library? Weblogic 10 in order to better modularity included components under WL_HOME/modules and weblogic.jar now refers to these components in the modules directory from its manifest classpath. So that means that other version of library sits on system classloader – the parent of all the application classloaders, so that means that those libraries included in application archives will be ignores based on the delegation scheme. (That was probably the idea why was recommended in J2EE classloading delegation scheme – child first). However weblogic does offer other way how to solve this case by so called classloader filters/interceptors defined in weblogic specific deployment descriptor either on ear level or war level.